Create a grocery shopping app Like GrubMarket for your grocery business. Do you plan to have a grocery supermarket? Have you still not planned to have an app for the same? If that’s the case, this blog will prove beneficial for you. There are a few difficulties that each business faces in the beginning. But a grocery shopping app development can be an answer to all the problems. The grocery shopping app is becoming more and more popular and expanding worldwide rapidly. There have been a lot of changes in the shopping behavior of people in the last few years. People work hard on weekdays and want to rest at home on weekends. Getting out of bed for grocery shopping on weekends is not a fun way to enjoy a holiday. Grocery home delivery app comes to your rescue on such weekend to allow you to order grocery right at your doorstep. Once you have placed the order, you can laze around without having to worry about the grocery or vegetable shopping. Two such grocery shopping apps that we will be discussing are Tesco grocery delivery app and GrubMarket grocery delivery app. Tesco has been there in the UK from many years and GrubMarket is just a startup but both of the companies have made huge profits in their business. Here is how. Tesco came to life when Jack Cohen, back in 1919 started selling extra groceries from a stall in the East End of London. In 1924, the Tesco brand first appeared in the market and became the largest grocery chain in the UK. According to Techcrunch reports, recently, Tesco is trying to provide one-hour delivery for online grocery orders in central London. Their customers will be allowed to select up to 20 items from around 1,000 products available. The orders will be picked and delivered within the chosen slot. They are charging a specific service fee depending on the delivery option and speed. Tesco grocery delivery is currently available at more than 300 locations in the UK. Their customers are increasing day by day and are reported to be grown by 20% in the past year. Tesco is expecting the UK’s grocery market to grow from $13 billion to $19 billion in 2020. This growth is expected to provide huge opportunities for the new entrants in the grocery business. 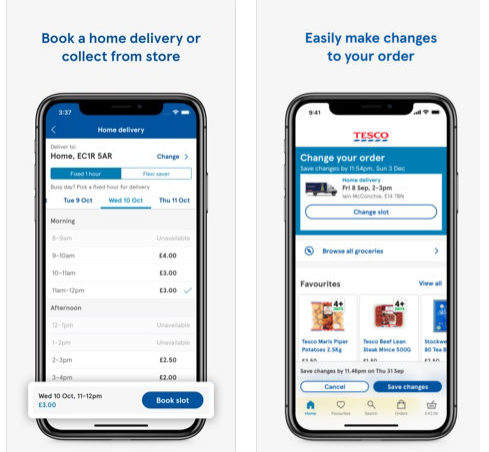 Using the Tesco app you can order food shopping and get your groceries delivered at your doorstep. You can also collect them from the store. 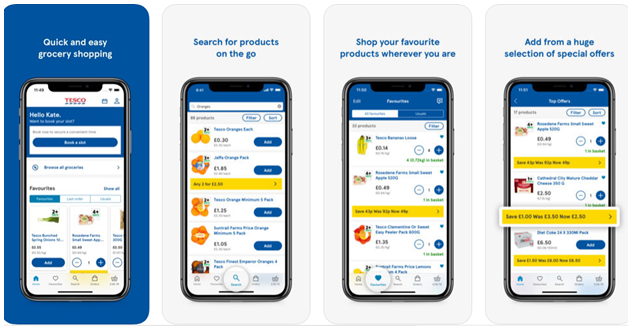 The Tesco grocery app takes you to the supermarket at the tap of your fingers. No matter wherever you are, you can just tap the app to shop, order and check out. 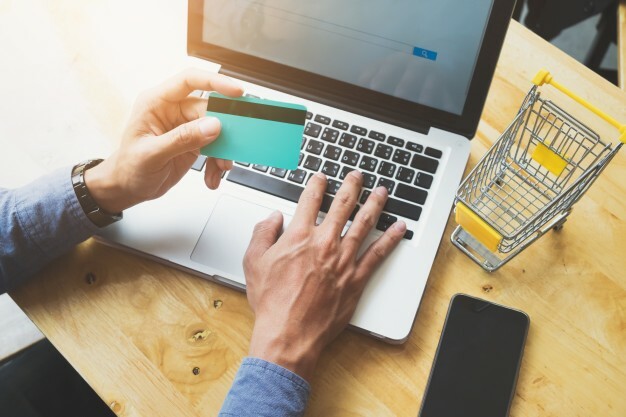 You can shop your favorite products in just a few moments. There is no need to worry in order to make changes to your order. A handy barcode scanner is available. The app lets you stay signed in for 30 days. You can add products fast from previous orders. You can arrange the delivery 7 days a week. You can collect Clubcard points for days out, travel and other such exciting things. In modern days, people are conscious about what they eat and they are aware of the chemicals which come as a part of any food. More and more people are turning towards organic products including grocery. A lot of organic grocery startups have emerged as a result in the last few years. GrubMarket is one of them which has created a buzz with its organic grocery delivery app. According to a report in Techcrunch, it has recently raised more $25 million for its idea of farm-to-table food. Mike Xu is the CEO and founder of GrubMarket which was founded in the year 2014. After counting all the funding rounds, they have raised around $89.1 million funds till now. After working with farmers and wholesalers to connect them to restaurants and other organizations and laying strong roots in New York and New Jersey, GrubMarket aims to expand far and wide. It has made acquisitions in the markets of Los Angeles and San Diego and is planning some more over a period of time. GrubMarket has a profound business model with affordable prices and unique strategies which make it successful. Its B2B (business to business) activity is much profitable as the company directly deals with restaurants, schools and other organizations. GrubMarket has made itself totally free from sellers. The food delivery that they provide is absolutely fresh and organic and according to the convenience of the customers. GrubMarket doesn’t need a working capital as it has raised enough profits in the last nine months. So, they are only focused on investing more in technology and acquisitions. Technology surely has an upper hand when it comes to expanding your business worldwide. The grocery delivery app for organic food and natural products by GrubMarket has made their purchase easier than ever. They have more than 7000 products listed on the app. And there are various categories belonging to fresh produce, snacks, drinks, health and beauty products, home goods and even vegan, gluten-free and non-GMO foods. They also have a fast-paced door to door delivery system for their consumers. So, if you are a startup, you too can think of building a grocery delivery app for delivering fresh and organic food to your customers. You should even make sure that you do not compromise the food quality while lowering the prices because that is going to build the trust between your grocery delivery app and your customers. At Coruscate, we have hands-on experience in delivering over 1000 on-demand delivery apps. We have developed dedicated grocery delivery apps for many of our clients and they have experienced a tremendous rise in their business after launching the apps designed by us. The secret to all these successful apps is our expert team of developers and our awesome team of researchers who sit together for brainstorming sessions. They dig deep to find out the scope and innovations that can be included when we design a new mobile app. We strive hard to deliver products that bring smiles on our client’s face. If you are interested to develop a grocery shopping app for your business and have an idea about the same, you can connect with us for a free consultation session. We can help you with our innovative technologies to take your business to the next milestone of success.